The oldest motorcycle company in continuous production, Royal Enfield made its first motorcycle in 1901. A division of Eicher Motors Limited, Royal Enfield has created the mid-size motorcycle segment in India with its unique and distinctive modern classic bikes. With its enhanced manufacturing base in Chennai, India, Royal Enfield is able to grow its production rapidly against a surge in demand for its motorcycles. With 50% growth every year for the last 3 years, Royal Enfield is fast becoming a very important player in the global mid-size motorcycle market and is working towards re-inventing this space with motorcycles that are evocative and engaging and great fun to ride. Royal Enfield’s product line‐up includes the Bullet, Classic and Thunderbird models in both 350 and 500cc displacements; and the recently introduced Continental GT 535cc café racer. Royal Enfield operates through 12 company-operated stores and 380 dealers in all major cities and towns in India, and exports to over 50 countries across the world including the USA, Japan, UK, several European and Latin American countries, as well as the Middle East and South Asia. Royal Enfield also organizes and supports many motorcycling events and rides , more prominently the Rider Mania – an annual gathering of Royal Enfield riders from all over India to the lovely beaches of Goa, and the Himalayan Odyssey, the most arduous motorcycle ride over some of the toughest roads and highest mountain passes in the Himalayas. Royal Enfield also conducts the popular ‘One Ride’ where people around the world ride out on their motorcycles on the first Sunday of April. 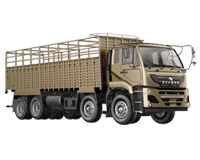 VE Commercial Vehicles Limited (VECV) is a joint venture between the Volvo Group and Eicher Motors Limited. In operation since July 2008, the company includes the complete range of Eicher branded trucks and buses, VE Powertrain, Eicher’s components and engineering design services businesses, the sales and distribution business of Volvo Trucks as well as aftermarket support to Volvo Buses in India. VECV’s vision is to be recognized as the industry leader driving modernization in commercial transportation in India and the developing world. 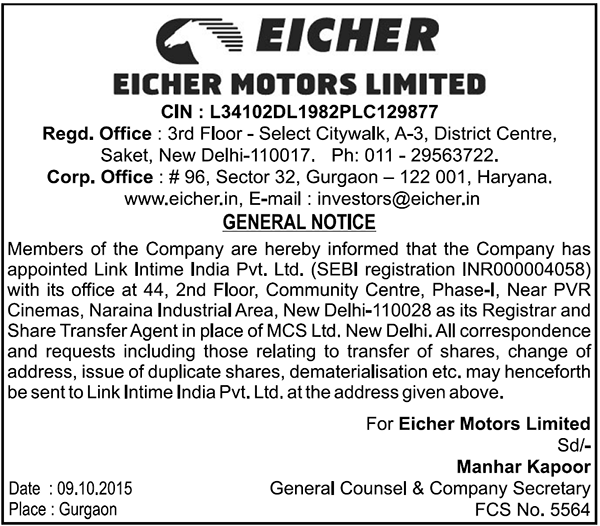 Eicher Motors Limited (EML) (Bloomberg: EIM IN Reuters: EICH.NS) is the listed parent of Royal Enfield, the global leader in middleweight motorcycles. The world’s oldest motorcycle brand in continuous production, Royal Enfield has made its distinctive motorcycles since 1901. Focussed on bringing back simple, yet engaging and accessible motorcycling, Royal Enfield operates in India, and over 40 countries around the world. With modern development facilities in Leicestershire, UK and Chennai, India, Royal Enfield makes its motorcycles in Tamil Nadu for the world. In addition to motorcycles, Eicher has a joint venture with Sweden’s AB Volvo - VE Commercial Vehicles Limited (VECV) - which is driving modernization in India's commercial vehicle space, and in other developing countries. VECV has a complete range of trucks and buses from 5-49 tonnes, and its integrated manufacturing plant in Pithampur, Madhya Pradesh is the global hub for medium duty five- and eight-litre engines for Volvo Group. For the twelve months ended March 2017, Eicher Motors recorded its highest ever total income of INR 7,033 crores (net of excise duty) which is approx USD 1.1 billion and is listed on the Bombay and National Stock Exchanges. 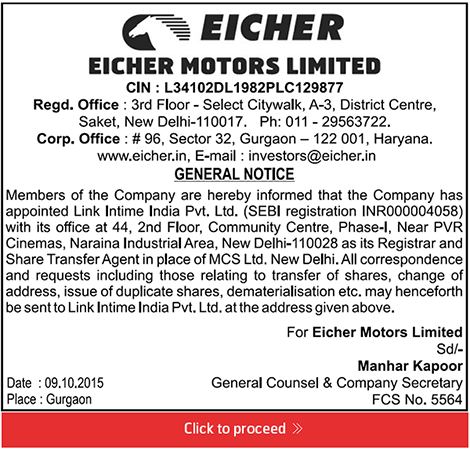 As of April 1st 2016, Eicher Motors Limited became a part of the Nifty 50 Index.